Electronic Voice Phenomena EVP & Paranormal Investigations. - Chapter 5. 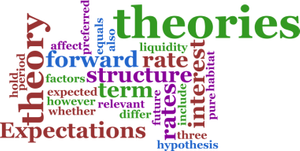 Theories are just ideas, nothing more than that. A Scientist will say he has a theory but we have just ideas. Let us look at what theories we can develop when we investigate EVP. If we look at EVP as a very real source of sound then we do need to consider what are the mechanics behind it that make it happen. When a human speaks there is a whole lot of mechanics involved to make even a simple sound and it has to be powerful enough to travel through air so we can hear it. Making a sound demands energy. Let us consider for this exercise a fact - That spirits do exist. The evidence that has been gathered so far appears to demonstrate two things. 1. Spirits are able to communicate, often through a medium, which a medium often sees through their 'minds eye'. Often a medium will see pictures of items as well as the person. 2. Spirits are able to move items, often heavy, either a small distance or they can disappear completely. I have experienced such an event when a pair of spectacles and a necklace disappeared into fresh air. This was my first ever paranormal experience. Some will say that moving objects is classic Poltergeist activity. In both cases, some form of energy must exist to enable either of the above to occur. What form of energy is required is open to debate but some form of energy is needed for these things to occur, that is a simple fact. Let us look at an example that we know is fact: You use your smart phone to download a movie or music track using your wireless connection on your phone. You then play the movie or sound track through your mobile phones media player. You can see and hear the track clearly on your phone. You do not see or hear anything as the data, which is energy, travelling through cyber space down to your phone, you just see and hear the results later. Is this any different to how spirits may or can communicate?. A medium being able to see pictures as well as hear sounds through their minds eye. The problem with Science is if they are unable to measure it they simply won't believe it - but it was only a few hundred years ago that Science told us the earth was flat. EVP: Energy + Sound Recorder = Sound. If we consider that a spirit will need some form of energy to communicate, manifest or move items, then we need to look at what possible sources are available for spirit to do that. Mediums will always mention 'energies' and there is scientific fact for that statement. If you attend a seance, a Medium will attempt to channel energy to establish a spirit connection. This chain of energy from people round a table is only as strong as the weakest link, so a total sceptic will affect this energy channel to the point contact with spirit becomes impossible. Why people that don't believe attend such events is left to their own reasons, but people do. I have performed at venues with a band and there is always someone who says 'I don't like this sort of music', I have to ask - why are you here then?. So back to my point - where does the energy come from?. BATTERY POWER DRAIN: I am aware of the countless reports of equipment power drain. For no apparent reason, fully charged equipment batteries suddenly loose all their power (energy) and often it's more than one single item which rules out a freak one off event. Once the equipment is charged they once again perform normally. We know this does occur. In all cases of sudden battery power loss all the battery energy is depleted - the battery is not flat it's completely dead. This sort of complete dilution of a battery is extremely unusual in every day use. HUMAN ENERGY DRAIN: I am also aware that when some people have attended paranormal events they have experienced sudden and unexplained loss of energy often making the person(s) so weak they are unable to stand up. In early 2016 I witnessed such an event when a girl at a seance was suddenly over come by weakness and illness, once she left the room her normal energy levels returned and she no longer felt ill. I was then able to match this sudden change in the girls well-being to the exact second to an EVP I had recorded of someone laughing which could not be heard at the time. In both cases we could consider 'energy transfer' as a very real possibility. I personally find this theory intriguing because to communicate or move something by force your going to need some form of energy. That energy has to come from somewhere so you need to either 1. Make energy yourself or 2. Acquire it from elsewhere. There are of course situations where things happen that defy explanation. 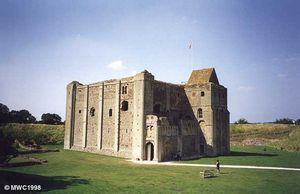 One such as example is Castle Rising in Norfolk England. Ghost Hunters International, a TV show I admire due to it's approach to research and trying to find alternative reasons to possible paranormal, attended an investigation at the location. One of the many strange events recorded at Castle Rising was a set of heavy wooden doors that in the morning were found to be open. The investigators carefully examined the doors and found they fitted perfectly and the heavy door handle was impossible to move by barging into or by opening by wind. The only way the doors could be opened was by lifting up the heavy clasp and pushing hard on the door at the same time. A CCTV camera was set up and at 5.30 in the morning the door opened on it's own with nobody near by. The investigators could not find an alternative explanation other than paranormal why this had occurred. If we look at the make-up of a spirit we may conclude that a spirit is an energy that also carries within it the memory of the deceased person. To enable a manifestation to take place or to communicate a degree of energy is required which during it's use either degrades or is simply used up. This may suggest why these paranormal events are short lived and not long lasting. The digital age has seen huge steps in technology and with it came 'accidental phenomena' such as EVP and the ORB. It is generally excepted in paranormal circles that an appearance of an ORB is the first sign of a spirit manifestation. The ORB is more prevalent with digital photography and digital movies and the ORB is often seen as a moving ball of light which rules out dust on the lens. I do except that the ORB has to be some form of energy force given it emits light and in the majority of cases can not be seen with the naked eye, this is no different with EVP, you don't appear to hear it at the time yet the digital recorder picks the sound up. We have a number of natures wonders that seem to defy rational explanation, the humble Fire Fly is one such example of a simple insect being able to emit a strong light source at will. On one occasion whilst monitoring CCTV set up at a ghost hunt, I witnessed an orb travel around the heads of twelve people who were sat round a circular table, the orb completely circling the table twice before moving away. My own thoughts on noises you hear during investigations, doors banging for example, I have not heard a voice that has interacted with the investigator when you hear the sound or voice. I consider this phenomena something different to EVP. EVP is sound that can not be heard but only recorded and listened to later. The reason for this is due to the source not having the mechanics to make a sound or able to move the sound through air for a human to hear it. I still feel that EVP can be broken into two areas: 1. Fabric or a dimension that has recorded a sound and plays it back when certain conditions are met. 2. Spirits communicating directly with humans in real time. THE DATA to SOUND CONNECTION: Looking at my own experiences with music, I have considered that EVP recordings are possible due to some form of data transfer. In music we have what is called MIDI. A common piece of kit is a MIDI Keyboard. This device looks like a piano and has keys, but when the keys are pressed it doesn't make sound it simply transfers data called MIDI notes (a programme change) to either a device or to recording software. The device or software then uses built in virtual instruments or effects called VST to make a sound. I produced a number of tutorials that cover this subject in detail below. I am sure these will help further your knowledge. Above photo:Castle Rising Norfolk England. EMF (Electro Magnetic Field) is a consideration you need to make in all locations and investigations, even just to rule out EMF as a possible cause. So what is EMF? In simple terms EMF is a physical field produced by electrically charged objects. If your close to higher than normal levels of EMF the symptoms will include paranoia, nausea and feeling unwell. Locations close to mobile phone masts and electrical pylons will have a higher than normal EMF reading but they are not the only source of EMF, where opinions differ are the long term affects to health when exposed to high levels for long periods, living close to an electrical pylon is an example of long term exposure. What we do know is that short and long term exposure can affect how you feel, more so if the person is more sensitive than is considered normal. Higher than normal EMF levels have been found in areas where people have experienced feeling 'uneasy' and conclude the area is haunted. One of the symptoms of high level exposure to EMF is paranoia which makes the persons experience even more frightening. I consider taking EMF readings before and during investigations as critically important, even if it's just to rule it out. 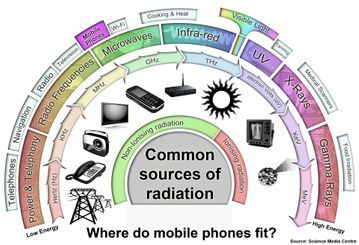 EMF can be found when close to anything that emits energy such as microwave ovens, washing machine/dryer, large battery chargers, electrical meter box's, mobile phones, computers etc. Of clear interest is the fact that some investigators have found their EMF meter suddenly 'spiking' when it was previously showing a reading of zero. I have seen evidence that these spikes occur when taking an EVP recording; the investigator asks a question and a few seconds later their EMF meter spikes which is then matched to the second on a EVP recording. Similar EMF spiking has occurred during sightings of ORB's, sudden noises or part manifestations (or shadows). This is good evidence that some form of energy is involved, something I personally believe occurs during paranormal events. Ghost or Microwave?. Investigation is about research and finding possible causes for any event. No matter how obvious something maybe. You do need to keep an open mind and always look for other possible causes. Here is a simple example of 'ruling in and ruling out' when investigating. Your conducting an EVP experiment and finding your EMF meter is fluctuating but only at a certain spot. You notice a microwave oven just a few feet away. You remove the microwave to a different room and notice two things, one is the area of EMF spiking is now showing no such reading and also the area you just took the microwave into is now showing EMF spiking. And the same 'rule in/rule out' equation would be used if you found the area showing EMF spiking before you removed the microwave continued when it was taken into another room, but again you should still look for other causes before concluding that the EMF spiking was something paranormal. So for example, your told that a house your investigating has a reputation of being haunted and your also told a story that 'ghosts' have been experienced on the stairs. The story may also be embellished with 'someone hanged themselves on the stairs'. This all adds to the haunted story and atmosphere of your investigation. Your EMF meter shows a reading on the stairs. Investigation uncovers under the stairs the main fuse box and other electrical wiring for the whole building. You may now have found your answer. Suspect any verbal information unless you have clear written evidence - PROVE that any fact given is fact. Consider the use of an EMF meter as important as your EVP recording device. I have copied the text below from my page 'Tools Of The Trade'. The EMF meter is to detect any electromagnetic field that maybe present. The potential health effects of the very low frequency EMF's surrounding power lines and electrical devices are the subject of on-going research and a significant amount of public debate. The link to EVP is that strong evidence exists that when Paranormal forces are encountered, unexplained fluctuations in the electromagnetic fields occur. Therefore an EMF meter that remains green showing no EMF present suddenly bursts into action and shows a series of lights depending on the strength of the EMF. One of the symptoms of exposure to EMF is nausea and light-headiness. The use of an EMF meter often forgotten is that it could rule out Paranormal activity being a cause of a 'troubled house' if you find high levels when you first arrive at a location. The house holder can then be informed of that finding to enable them to seek help from other sources like the Local Authority. For EVP investigations it could prove to be a useful tool. Your recording silence with EVP and if you suddenly get your EMF meter flashing which you can time match to other activity, then it could provide further evidence with your research. I would be delighted to hear about any research you have conducted with an EMF meter. If there is a case or not for an EMF meter being a 'ghost alarm' is not relevant due to the fact you could rule in or rule out EMF being present in a house which would cause those living in that house ill health and the very symptoms which they felt were Paranormal when in fact it was the high level of EMF being the problem. 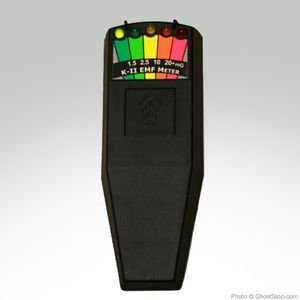 The meter shown above is the K2 EMF meter and appears to be the industry standard with Paranormal Researchers. It uses a simple but effective LED light system, green being normal and then going to various colours before hitting red. It is silent in operation which is important with EVP recordings being taken at the same time. Built in the USA but available in the UK for approx £50.00. Go to this LINK for further information. ABOVE: The K2 EMF Meter. A high number of EVP investigators have experienced and reported that when listening to EVP recording playbacks, the common language used has been English despite the fact the location being investigated had no known English language connection. Having listened to a high number of these recordings I have to conclude that this does occur in the majority of EVP's that have been recorded at none-home Country locations, not all recordings but certainly higher than 80%. This 'English only' connection is fascinating given it shows a high degree of intelligence involved, the spirit knowing you don't speak the native language so communicates in your own native tongue which in turn suggests the spirit is trying to communicate with the investigator directly. Can this really be possible?. Most of the none English language EVP recordings have needed someone to translate the language being spoken. A number of the more popular TV paranormal shows visit many different countries and investigate all manner of locations and it is these shows that firstly flagged up this 'English only language' phenomena. Interesting indeed. If you only investigate locations close to your home then your extremely unlikely to experience this phenomena. Further research is required before we can reach a conclusion. Please get in touch if you can add further to this subject.